After their great success with the live recording of J S Bach's Christmas Oratorio, the Chamber Choir and Ensemble Frauenkirche directed by their Kantor Matthias Gr�nert present the B minor Mass. This work is often considered to be Bach's ultimate achievement, because it unites all the styles of the Baroque in their final form and thus represents the conclusive pinnacle of Baroque music. 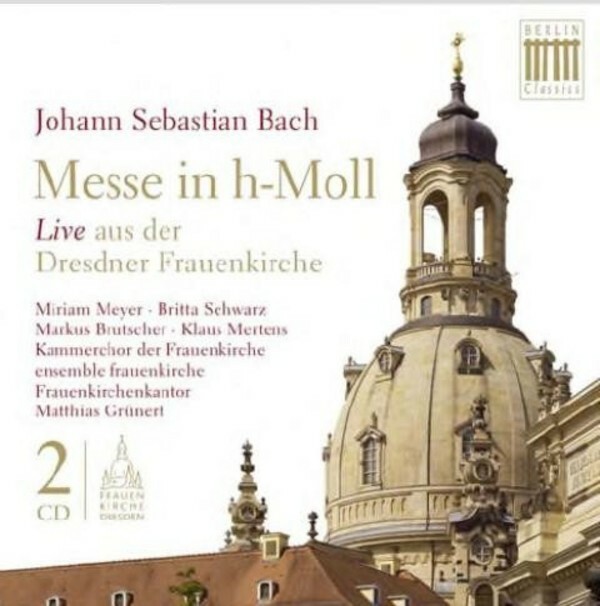 The B minor Mass was sung in July 2014 at a very special venue: the Dresden Frauenkirche, which almost ten years after its rededication has become both a place of reconciliation and a venue for a rich variety of music. Bach himself was well acquainted with the Frauenkirche, performing there in 1736 on the newly installed organ. It was at this time that Bach was given the title of 'Court Composer', for which he had applied some years before at the Dresden court. And he did so with an early, even shorter version of the B minor Mass. Set against the background of this cross-connection, the Dresden concert proved to be a very special evening. Joined by topflight soloists, the performers brought out the musical riches and exalted grandeur of the 'High Mass'. The present recording, made live on the night, is now released, almost to the day, to mark the 330th anniversary of the great composer's birth and shows on its two CDs, from the opening Kyrie to the final Dona nobis pacem, how impressively this music plumbs the depths and scales the heights of the Latin liturgy. Matthias Gr�nert always sticks close to the sung text and its symbolism, widely varying his tempos to conduct us on a journey - now thrilling, now almost meditative - through this mass of masses.